Route : from Little Town, a clockwise circuit of the Newlands valley. Wainwrights : (8) Cat Bells, Maiden Moor, High Spy, Dale Head, Hindscarth, Robinson, Knott Rigg & Ard Crags. This was route long pondered but always declined in favour of other, more craggy fells. Reading a blog by fellbound, who trod a similar route recently, brought it back into focus. 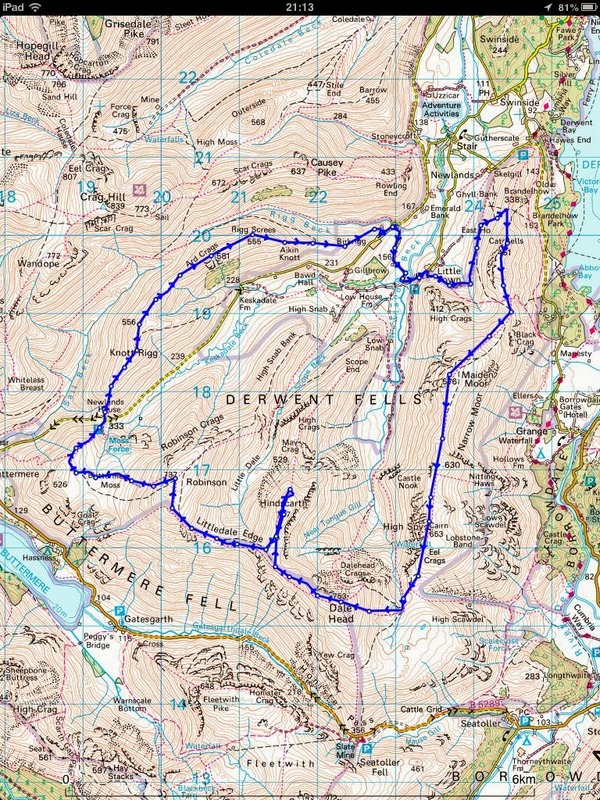 This, along with the prospect of bagging a further 8 Wainwright fells in my quest, cemented the plan. I set off from Little Town at the foot of the Newlands valley at 1pm and followed the path along the western side of Cat Bells, the first of the days objectives. I had intended to walk right around to the north side of Cat Bells and then follow the tourist route to the summit but as I passed the half way point I spotted an obvious path through the bracken which made its way steeply up the west side to the ridge above. I headed upwards, pleased to shave an hour off the planned route at the expense of a short but thigh burning climb. Once on the ridge, Derwent water comes suddenly into view and also so do the crowds. From passing just a handful of walkers to this point I was now suddenly part of a procession meandering along the ridge to the summit. Wainwright describes Cat Bells as a family fell and it was certainly occupied by folk of all ages today. The final push to the top is quite craggy and steep in places which was pleasantly unexpected. Unsurprisingly the summit was full of folk mooching around or sat eating their lunches while enjoying the views over Derwent Water & Keswick, which really are 'quite nice'. This is not a scene which inspires the solo hiker though and so I headed off along the ridge towards Maiden Moor, hopeful that the crowds would dwindle with distance from Keswick. The path from Cat Bells continues along the ridge following Derwent Water for about a mile before turning westwards on a gradual climb towards the large grassy plateau that is Maiden Moor. The actual summit Cairn is off the main path on the west side and is easily missed. From here there are good views over the valley towards Hindscarth but in all other directions the flat summit expanse obscures all but the distant fells. The path continues southwards following the lie of the land gradually upwards towards High Spy. The summit of High Spy is another flat plateau with steep crags falling away on the western side but the stand out feature is its statuesque summit cairn. It also provides the first views of Dale Head which was the next objective. As I left the summit a pair of walkers came up from the Keswick side, circled the cairn and then turned back. These were last people I saw until returning to the car the following day. High Spy summit looking towards Dale Head - now that's a summit cairn! On leaving High Spy the path drops to a wide col where Dale Head Tarn nestles against the steep flanks of its parent fell. Sitting next to the tarn I briefly considered making camp. It was a lovely sheltered spot and a welcome rest from the buffeting wind which had been steadily increasing for the past hour. It was only 4pm though, and despite the temptation for an early respite I headed on up the steep path to Dale Head summit, which was the hardest work I had done since Cat Bells. The summit of Dale Head is a fantastic place to be. The view as you emerge onto the top are some of the best I have seen in the Lakes and made all the better by its magnificent summit cairn which belittles even the one on High Spy. In all directions the view is stunning and I spent a good half hour wandering around taking pictures. Thankfully the cloud had lifted from the Scafells and so the whole panorama was uninterrupted. I reluctantly left Dale Head summit and continued along the ridge towards Robinson. After a few minutes Buttermere comes into view. It really is a lovely aspect looking down on the lake with Fleetwith Pike at its head and the High Stile ridge, from Haystacks to Red Pike, stretching out across the opposite bank. After just 1/2 mile the ridge to Hindscarth merges from the right to create a 'T junction' of sorts and I followed this path along an easy 1/2 mile to the summit of Hindscarth. By this time the sun was getting low so I began the search for a camp site. The wind was blowing strongly from the west and so I headed towards the leeward side which is a sloping grassy area. I managed to find a flattish tent sized spot and set about making camp. It was far from a good pitch as the pegs kept hitting bedrock after 2 inches and so I was unable to get them in at the ideal places. The tent was secure though, if not drum tight and pretty. After setting up and eating some hot food I walked the short distance to the summit ridge to sit down watch the sunset. Hat, gloves and down vest were required to keep warm for that half hour. The following is a 'tongue in cheek' video of the pitch …. which certainly wasn't pretty. 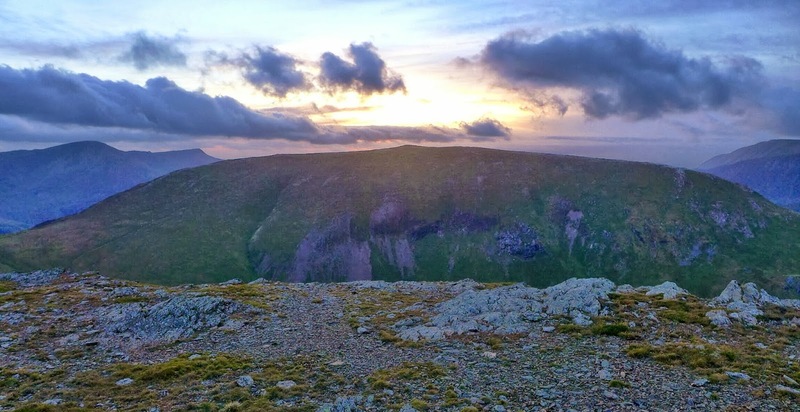 It was a cold and windy night but nothing out of the ordinary for a lakeland summit camp. In the early hours I ventured out to 'spend a penny' and was greeted by a clear sky with a full moon which was low in the sky over Maiden Moor. It was too good a photo opportunity to miss so I grabbed the camera and tried for 10 mins to keep it steady enough for a decent piccy. I only had a mini tripod and the wind kept buffeting it so the best I could manage was trying to holding the camera steady on a rock. I woke at 6 ish and opened the tent door to a lovely red sky forming over Clough Head. Unfortunately, 20 mins later, the cloud rolled in from the south and stayed there for the rest of the morning. I packed up and retraced my steps back to the main ridge and then along to Robinson. Every now and then the mist cleared for a few seconds giving views down to Butteremere. Robinson summit was shrouded in thick cloud and after waiting for 10 mins it didn't seem likely to clear any time soon so I headed off down the steep path towards Butteremere Moss and Newlands Hause. The initial descent is along a steep rocky path but as Buttermere Moss is reached the land flattens to becomes a wide mass of soaking wet sphagnum moss interspersed with grassy tussocks. Trying to step from tussock to tussock is unfortunately no defense against the drenched ground and I soon found myself sploshing across this boggy expanse with no escape from the water. Eventually a path appears which follows the shoulder of High Snockrigg before dropping steeply to Newlands Hause. From the road at Newlands Hause a good path leads steeply up to Knott Rigg, at the top of which is a small pile of stones which serves as a summit cairn. From Knott Rigg a broad ridge is followed for about a mile towards Ard Crags. It has to be said that Ard Crags is decidedly uncraggy. In fact it appears to be a mile long ridge with steep heather covered flanks and not a crag to be seen as far as I could see. Ard Crags - but where are the crags? Looking back up at Ard Crags and still wondering where the crags are? The descent route follows a steep path which cuts through the heather, dropping down to the foot of the Newlands valley where it joins the road to Little Town. So that's 106 Wainwrights and just 1 short of halfway. I'm not sure what to tackle next. Perhaps the Skiddaw group or some of the fells north of Blencathra. Til next time. Thanks for reading. Food : Wayfayrer chicken jalfrezi, Buttered Bread, Supernoodles,various sugary snacks. Bits & Bobs : headtorch and spare batteries, Iphone + Anker 5800mHh battery, victorinox knife, map & compass, basic first aid kit and Petzl e-lite, spork, various fold dry bags, flint & steel, plastic trowel. Camera : Panasonic DMC-LX7 & lowepro case. Clothes : Ron Hill wicking T-Shirt, Rab 100 wt fleece (250g), Mountain Equipment Ultratherm jacket (275g), Rab microlight down vest (310g), TNF Meridian Cargo Shorts (190g), ME beany, Rab phantom grip gloves, sunglasses, Buff, Innov8 short socks. Hard Shell = Mountain Equipment Firefox jacket (320g) and trousers (259g) not used. 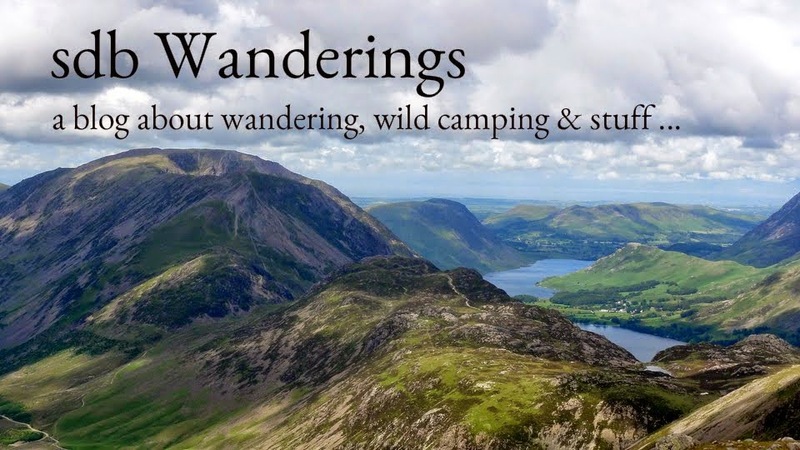 I have been looking back at a decade of photos from various Lake District walks and pondering whether it is worth putting these old trip reports up on the blog. I very quickly decided not to as most are day walks which countless others have done countless times. But there are a few reasonable pictures amongst the many mediocre ones and it seems a shame to have them sat on my hard drive gathering the proverbial dust. So I thought I would post a collection of my favourite photos from many different walks, a gallery of my best photography efforts I suppose. My own efforts are very much secondary to the walk and serve to provoke memories and capture the views which I find inspiring. I tend not to let the camera guide the walk too much although admittedly, with increasing regularity, I'm finding myself loitering on fell tops waiting for the light to get just that little bit better. I'm not kidding myself though. The good ones have largely been a series of lucky flukes or through just being in the right place at the right time. Wild camping in the Lake District has certainly helped with the latter as the first and last hours of the day really bring out the best of the fells and it is hard not to capture at least some of this splendour with a half decent camera and a vague idea of where to point it. And so here are a selection of my favourite flukes of my favourite fells. First up are the Langdale Pikes. As with most folk who spend time in the Lakes, I never tire of looking at their iconic profile. Wherever I am in the lakes, from whatever fell top, I always tend to survey the skyline looking for the familiar shapes of the classic lakeland fells by which to work out my bearing. The Langdale Pikes, along with Great Gable, must be the most 'looked for' landmarks by which I can then place other surrounding fells. Some folk talk about mountains provoking certain feelings; the 'Pikes' feel homely to me, perhaps because they sit proudly in the middle of the area I am most familiar with in Lakeland. In my opinion nobody sums up the Lakeland fells better than Wainwright himself. This is what he has to say on the 'pikes'. "No mountain profile in Lakeland arrests and excites the attention more than that of the Langdale Pikes and no mountain group better illustrates the dramatic appeal of a sudden rising of the vertical from the horizontal; the full height from valley to summit is revealed at a glance in one simple abrupt upsurge to all travellers on the distant shores of Windermere and, more intimately, on the beautiful approach along Great Langdale." Poetry indeed. Of course the 'Pikes' are generally accepted as referring to four distinct peaks; Harrison Stickle, Pike of Stickle, Loft Crag and Pavey Ark. Only from the south can they all be seen together from a single vantage point and so the 'Langdake Pikes' may mean different things to different people depending on where they are viewed. The picture above, taken from Elterwater, shows the typical 'tourist' profile of Harrison Stickle in the centre with Loft Crag on the left and Pavey Ark on the right. This is the aspect also seen from Bowness and the road to Ambleside and therefore adorns the many place mats and coasters in their trinket shops. But for a finer appreciation of the Pikes you have get in, amongst and around them. This aspect shows the Pikes seen over Wrynose Fell from 'Prison Band' and was taken while walking from Swirl How to Wetherlam. The distinct profile of Pike of Stickle can now be seen on the far left, while Loft Crag loses its profile against High Raise. Harrison Stickle is the highest point on the right and Pavey Ark is just visible through the cloud. This picture was taken from Rossett Gill and shows Pike of Stickle bathed in dappled evening sun on the return journey from the Scafell Pike walk. Mickleden Beck winds its way along the Great Langdale Valley towards Lingmoor Fell. From a technical perspective its a poor shot, the highlights are badly blown but I don't care. I like the colours of the scorched Bracken and the contours of the valley. The above shows Pike of Stickle from valley floor to summit. On my 'to do' list is a direct ascent of this face and along the gully on the right. It looks as if it couldn't take more than 1/2 hour but of course looks can be deceiving. The full height is 2323 feet and the vast majority of those feet are climbed in one direct line from valley floor to summit. The summit of Great End must offer some of the best views in Lakeland. This picture looks down under darkening clouds along the Great Langdale valley with three of the Langdale Pikes on display and Windermere visible in the distance over Lingmoor Fell. This must be my favourite view of the Pikes. I always think there is something special about looking down on these majestic fells from a high vantage point. Their profile is somewhat lost from the lofty heights of Bow Fell & Esk Pike but on the descent between Esk Hause and Rossett Pike they slowly begin to take shape again against the skyline to the point where you just have to stop and admire. This shows the western side of the pikes where just Harrison Stickle & Pavey Ark can be seen. It was taken from near Blea Rigg on a cold March morning. Stickle tarn is still frozen. This picture shows the best way up Pavey Ark. Jacks Rake is a steep scramble seen climbing diagonally under its shear face. Whilst it looks like a terrifying prospect from this vantage point, the route is fairly straight forward and with a much lower sense of exposure that seems likely when gazing up from below. Next up is Bowfell, admittedly my favourite place to be in the lakes. If the Langdale Pikes feel 'homely', Bow Fell feels decidedly more harsh & intimidating. This may be because it seems to attract cloud and bad weather like no other fell and once visibility lost, its summit can feel hostile and disorientating. For me, the best ways up are via The Band or from Crinkle Crags, but with either way, the climbers traverse / great slab route show the superb rock scenery at its best. For lots more pictures and detailed route see here. The above picture is taken from climbers traverse and shows Cambridge Crag on the left and Bowfell Buttress on the right. A brave walker could scramble up the gully between the two but the best way up from this point is to follow a steep diagonal path along the left side of Cambridge Crag which then emerges by Great Slab. This is the iconic viewpoint of Great Slab as drawn in Wainwright's pictorial guide. In the background, the Langdale Pikes complete the scene. This view shows the diagonal route along Cambridge Crag and Great Slab from the climbers traverse route. Two tiny figures can be seen emerging from the top of the boulders to give some scale to this grand scene. Walkers who choose the 'normal' way up Bowfell would miss out on this stunning rock scape. Bowfell's slightly more serene face is on the Eskdale side. This view is from the path from Great End to Esk Hause and shows Bowfell as the highest point and the Crinkle Crags trailing off on the right. Next up are a random selection of favourite pics from many different walks. As you may have gathered, I'm attracted to pointy bits of rock when out in the fells so most are of that ilk. There is less chit chat and more pics.